Info "Keep the old man floating over your head!" 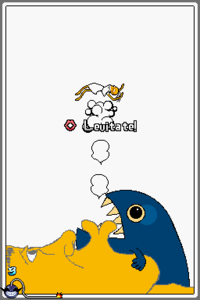 Light Sleeper is a microgame found in WarioWare: Touched! in the Mic Rocking stage. The game's objective is to blow into the mic to make the old man float. If he falls or touches an obstacle, the player loses the game. 1st level difficulty: There are no obstacles. 2nd level difficulty: A chomp-like monster is found near the man. 3rd level difficulty: A chomp-like monster is found, as well as arrows that fire from random spots. This page was last edited on April 7, 2018, at 05:16.